I (Gary) was asked to give the opening talk for Calumet Heritage Days last night August 12, 2013. I spoke in the very beautiful Keweenaw Heritage Center, once the home of St. Anne's Catholic Church. The venue was amazing, but the acoustics were not so great for presenting. This presentation was supposed to be the last of our full and very involved summer presentation schedule, but a new one was added on August 20 in Marquette. 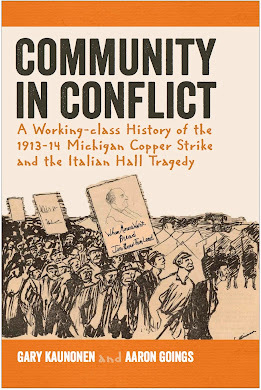 I will be speaking to a group of journalists about the 1913-14 Strike, in general, and plan to share some of our new research on Italian Hall. Specifically looking at the media coverage of the Italian Hall giving special attention to WFM media outlets: Miner's Bulletin and Tyomies.